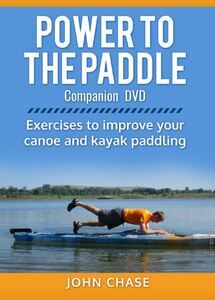 The long-awaited companion DVD to my book “Power to the Paddle: Exercises to Improve your Canoe and Kayak Paddling“, is now available for only $19.95, with free US shipping! This DVD brings to life more than 50 exercises from the book “Power to the Paddle: Exercises to Improve your Canoe and Kayak Paddling”, to help you be a stronger, lighter, more powerful, and more confident paddler. Whether you are new to the sport or a seasoned veteran, Power to the Paddle will take you to the next level. Purchase your copy today for only $19.95 with free US shipping!